The largest trade show in the gear industry, Gear Expo, is now only six months away. Gear Expo 2015 will descend upon Detroit’s Cobo Center October 20-22, and, hopefully, you have already made plans to attend, because this year’s Expo will be better than ever. Anyone who has ever attended a Gear Expo in the past knows that Gear Expo has prided itself on being the only trade show devoted to gearing. This year, however, we are expanding our reach to be the “Drive Technology Show.” This is not a name change, nor is it just a new marketing pitch. Gear Expo 2015 will have an expanded exhibitor base, more education programs, and more attendees than ever before. While you will still be able to find the latest equipment for making gears, and see new technologies in the gear industry, we have more gear manufacturers exhibiting, and a broader variety of exhibitors that cover other parts of the power transmission industry. The aim is to cover the entire gear system. The show will provide the staples that gear manufacturers and gearing professionals need for success. Additionally, this year we will begin providing resources for end-users of gearing from a wide range of industries. At Gear Expo everyone will be able to find the latest technologies to solve their power transmission challenges. There are currently more than 200 exhibitors on the show floor and only a handful of spaces remain – this will be one of the largest Gear Expo events in its history. Beyond the show floor, Gear Expo 2015 will also have an expanded education program. Whether you need the latest gear research, want the basics of gear manufacturing, or need to better understand how to keep your gear system in optimum shape, there will be an education program for you. The Fall Technical Meeting will showcase more than 25 reviewed papers on technology in our industry. New programs will be offered for users of gearing and gear systems, such as gearbox maintenance. Classes will be offered for the breadth of gearing professionals from those new to the industry to seasoned design engineers. There is a teaser for some of these classes on the next page, but we are putting together the final pieces, so visit the Gear Expo website often in the next few months as we unveil the final programming. We will also be tweeting out new additions as more classes are added, so follow us on Twitter @agma. If you can’t spare a few hours or a full day during Gear Expo to take a seminar, there are still education opportunities for you at the Solutions Center. This perennial favorite will be back showcasing short presentations from Gear Expo about the latest technologies that you can see on the show floor. In addition to the more than 20 presentations from exhibitors, there will also be three keynote presentations at the Solutions Center on broader manufacturing topics. On Tuesday, October 20 we will have the latest gear industry economic forecast; on Wednesday, October 21 the Solutions Center will highlight the latest innovations in material technology; and finally on Thursday, October 22 our keynote will be a panel discussion of the emerging technologies (such as 3D printing, the Internet of Things, and new condition monitoring techniques) that may affect the power transmission industry in the next few years. Gear Expo 2015 will once again partner with ASM International’s Heat Treat Show, which brings even more exhibitors, networking opportunities and education programs to a great week of events in Detroit. The new, expanded Gear Expo is truly the “Drive Technology Show.” If you haven’t marked your calendars yet, make sure you plan on joining us October 20-22 at Cobo Center. Hotel reservations and registration are now open at www.gearexpo.com, so make your plans now. AGMA’s newest course, Bevel Gear System Design, is back this year as part of AGMA’s Advanced Gear Engineering Academy. The program will be taught by gear expert Raymond Drago of Drive Systems Technology, Inc., June 9-11 in Rosemont, Illinois. This is an advanced engineering course, and basic gear engineering knowledge is required. The course is designed for gear engineers, gear designers, application engineers, people who are responsible for interpreting gear designs, technicians and managers that want to better understand all aspects of gear design. The majority of the course material is presented through qualitative descriptions, practical examples, illustrations and demonstrations, which require basic mathematical and engineering skills. However, some familiarity with gear design and application will enhance overall understanding of the material. By attending this course, attendees will be able to improve their gear designs including how to investigate differences in stress states among various surface durability failure modes; better understand when to use straight bevel, spiral bevel or zerol bevel gearing, and discuss benefits of traditional and recently developed techniques for manufacturing bevel gears. Attendees will gain new insight into the concepts presented through illustrations and demonstrations, while interacting with their peers and with a talented and well-respected instructor who will push your thinking beyond its normal boundaries. 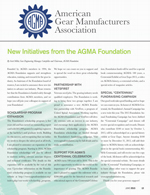 For more information as well as a full outline of the course material, or to register, visit www.agma.org. Gear Expo 2015, “The Drive Technology Show,” will feature an expanded education program that covers topics of interest to gear designers and end-users of gear systems. Regardless of whether you are new to the industry, or a seasoned veteran, there will be opportunities for you this fall. The following information is a preliminary list of the programs that are going to be offered at Gear Expo 2015. Visit www.gearexpo.com regularly, or watch this space in future issues, as new classes are being added. 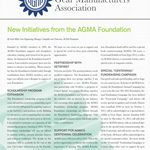 AGMA’s Fall Technical Meeting is a great opportunity for anyone in the gear industry who is interested in the latest research and technical developments in gearing. The 2015 Fall Technical Meeting will have more than 25 presentations divided into five sessions over three days. • Learn more about methods and cutting edge technology that will help you operate better. There are five sessions to the Fall Technical Meeting, covering Manufacturing; Materials & Heat Treatment; Lubrication, Efficiency, Noise & Vibration; Gear Applications; and Gear Wear & Failure. Dramatically improve your knowledge and productivity through this classroom-only version of AGMA’s popular “Basic Course” of the Training School for Gear Manufacturing. This course will be presented in three, half-day sessions that will give you in-depth training in standard nomenclature, gear involute geometry, inspection procedures and much more. AGMA in cooperation with ABMA is offering this course on rolling element bearings for those involved in industrial equipment design, reliability, and maintenance. It will include a basic overview of rolling bearings, their selection, precision and mounting considerations, service life estimation and lubrication related influences. A hands-on damage analysis session is the featured portion of this program. Explore just what High Profile Contact Ratio (HCR) gears are and under what circumstances they can be an advantage. Learn when HCR gears are not appropriate and why. This fast paced session will cover the detailed tooth geometry changes that are required to effectively achieve optimum performance and benefit. We will discuss how the load distribution along the involute profile changes when the contact ratio increases above two. Because of the longer, generally more slender teeth on a HCR gear the heat treatment and profile modifications that are required for good performance are distinctly different from those for a standard contact ratio gear. The load capacity rating of HCR gears requires the application of modified AGMA analyses as the AGMA Standards specifically do NOT address gears with profile contact ratios greater than 2.0 thus we will also cover the changes required to successfully rate HCR gears. Pack your “bag of tricks” with knowledge of how teeth deflect, what involute interference really is, the potential consequences of inadequate profile modifications, and the differences between tip relief, flank relief and fully modified profiles. Students learn how to calculate tooth deflections under load and, most importantly, how to modify a gear set properly to completely eliminate involute interference. 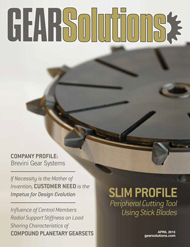 Finally we will examine the optimum drawing definitions for profile modifications and how to interpret involute inspection charts to determine if the drawing required profile modifications have actually been produced on the gear set. Gears, because of their unique contribution to the operation of so many machines and mechanical devices, have received special attention from the technical community for more than two millennia. New developments in gear technology, particularly from the materials and heat treatment perspectives, have improved gear performance. 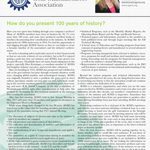 This course, developed jointly by AGMA and ASM International, will provide an overview of materials selection and heat treatment of gears. The Gear Expo Solutions Center is back by popular demand. Get the latest information on manufacturing techniques and technologies from Gear Expo exhibitors by taking part in these FREE presentations in the exhibit hall. Each day will also feature a keynote presentation highlighting the latest business trends in the power transmission industry. 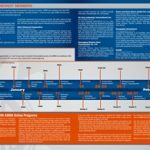 A complete schedule of Solutions Center presentations will be available in June. Programs in gearbox maintenance, lubrication, and inspection are being added in the next few weeks, so make sure to visit www.gearexpo.com for more information and to register for these programs. 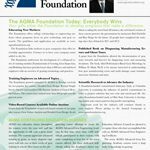 The AGMA Foundation Today: Everybody Wins Your gifts allow the Foundation to develop programs that make a difference.